The SuperG box is the “brain” that connects PianoArc keyboards/sections to your computer and outboard MIDI gear. Simple connections to extraordinary capabilities. 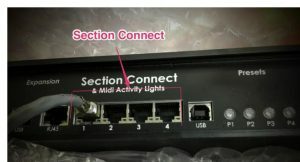 SuperG Box connects to PianoArc sections via Standard Network Cables. Easy USB connection: Merges EVERYTHING (PianoArc keyboards, control pads, pedals) into a single USB compliant output. Quick/Convenient Setup: Connect up to 4 PianoArc keyboard sections via standard Network (RJ45) cables. Additional Performance Control: Twelve pedal inputs – 6 switched (sustain, patch change etc) , 6 continuous (expression, modulation, etc). That’s right – 12! One touch control of MIDI Zones. Four one-touch presets give access up to 16 separate MIDI zone/channels. Dual MIDI IN/OUT for standard module connections. LED/Light Show control. Each PianoArc key/note has it’s own dedicated multicolor (programmable) high intensity LED – and the new Super G Box allows control ranging from completely off, to on when played, to “light show mode” where the colors pulsate and swirl along with the player’s performance. Options: Zone-Color on (default), light notes when played, rotating “movement” show, completely off. Section “aware”: Automatically recognizes number of PianoArc sections connected and offers presets configured and optimized for the number of sections connected (1 to 4). Charging ports: 2 power outlets for extra USB gear (iPad, phone, other MIDI etc). Size: Standard 19″ rack mount. Fits into existing racks. Bottom line, the new PianoArc SuperG box offers a single source USB connection and extraordinary performance control.